The Second Amendment Foundation today defended the right of women to defend themselves with firearms during testimony at the United Nations regarding the proposed Arms Trade Treaty. “Eleanor Roosevelt was known and revered for her beliefs in woman’s rights—including the right to defend oneself with a firearm if necessary,” Versnel stated. “Mrs. Roosevelt practiced what she preached. In 1958 Mrs. Roosevelt drove though the American South by herself. The Klu Klux Klan had put a $25,000 bounty on her head and the Secret Service told her not to go. She went anyway and on the seat of the car was her own .38 caliber revolver. Revised and updated, 10 March 2013. 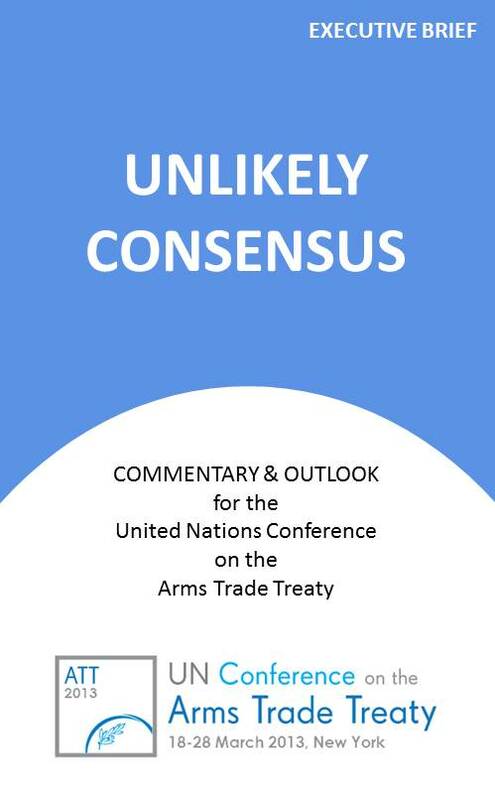 TSM Worldwide LLC has published its executive e-briefing of selected context and issues going into the United Nations Arms Trade Treaty (ATT) Conference scheduled for 18-28 March 2013 in New York. It also models five possible outcomes and explains the key factors for why consensus is possible, but not likely. This concise resource can serve as a sense-making tool for diplomats, international legal specialists, civil society activists, trade groups, academics, students, and strategic business leaders alike. The author, a former military diplomat and strategy leader at a leading defense/aerospace company, consulted over thirty ATT process insiders to develop this his assessment. For example, this e-briefing incorporates insights and feedback from members of State delegations, humanitarian and arms rights civil society groups, academics and policy analysts, business managers, and trade associations. It also includes original statistical analysis and several insightful graphics that help illustrate the points made. 1. Explain how a faction of approximately 30 countries presents a major wildcard for the Conference and what their vision for a future treaty might entail if they decide to break consensus to realize it. 2. Explore the multi-dimensional quantitative challenge of commanding consensus by examining estimated opposition and support for the ATT, and to suggest where and how prospects for consensus could be improved the most. 3. Describe three assumptions widely held by some States and their humanitarian partners, and explain why these assumptions are perceived as a form of misguided or dishonest humanitarianism which drives against consensus. 4. Survey several complexities with respect to the United States, and highlight three conditions the ATT must meet if it is ever to be ratified there. 5. Present a probability framework for five potential scenarios with respect to reaching consensus at the Conference. 6. Explain why the most likely scenario for the Conference is that a faction breaks consensus by mounting a coup to pursue their own more progressive version of the ATT. The e-briefing is approximately 25 pages and is for sale on Amazon.com for use on all desktops, laptops, Kindle readers, tablets, ipods, and smart phones through Amazon’s free Kindle ap. The price is $2.99 USD. Click here to link to Amazon.com. Click here download free apps for viewing electronic publications for Windows (XP, Vista, 7) and Mac (OS X 10.5 and above).